Pretty Me Up! : Etsy Review: Happy Endings Bake Shop! Etsy Review: Happy Endings Bake Shop! "LIKE" Happy Endings Bake Shop on Facebook! Welcome to Happy Endings Bakeshop! We are a bake-to-order business with a menu of hand baked yummy treats designed to make you smile. 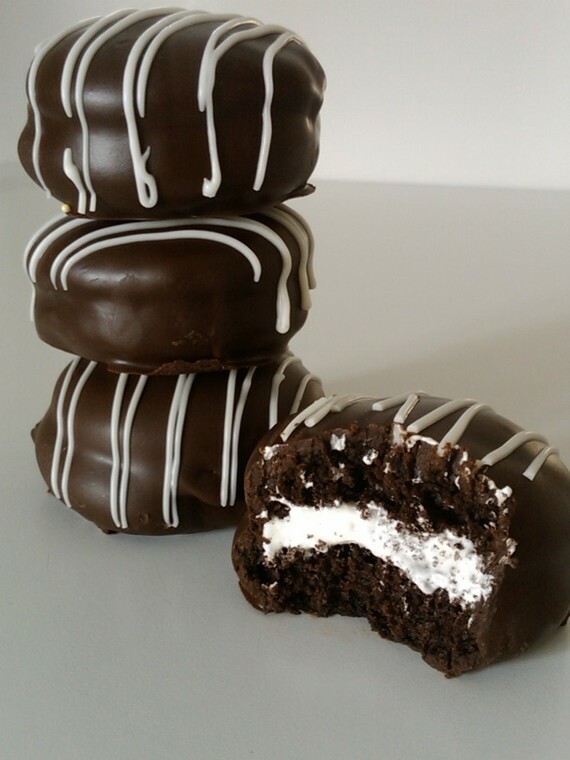 Our signature goodies are Whoopie Pies hand-dipped in special coatings and available in over 30 flavors. And Stuffed Brownies, fudgy and decadent, with your favorite candy bar baked in the center. We are based in the Detroit Metro Area and deliver locally. We also ship nationwide. Our mission is to make people utter uncontrollable yummy noises and smile because...doesn't everyone deserve a Happy Ending? My name is Lissie and I love sweets. I love how a good piece of chocolate melts on your tongue. I love that the smell of cinnamon and sugar bubbling in the oven can make a grown man swoon. And I love to watch folks eat the things I’ve baked, with their eyes rolling back in their heads and yummy noises coming from their throats. I come from a long line of women who took great joy in showing their love for others by melding sugar, butter and eggs into tantalizing treats. In the end, to paraphrase my favorite musical philosophers, I believe that the love you take is equal to the love you bake. I hope I’ll get the chance to give your day a Happy Ending. This one made it to my top 3 favorites! I scream, you scream. We all scream for Orange Creamsicles! All the flavors you loved as a kid, recreated in a delectable Whoopie Pie. 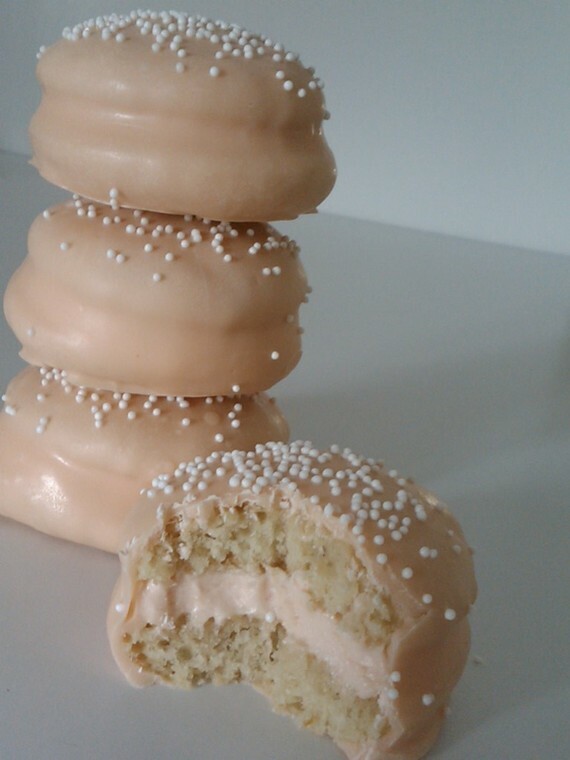 Two rounds of orange butter cake that sandwich an orange vanilla cream cheese buttercream, coated in a fanciful pale orange candy coating. Refrigerate, eat them cold and the only thing you might miss is the popsicle stick. Banana, Marshmallow and Peanut Butter. THIS IS MY FAVORITE OUT OF ALL OF THEM!!!!!!! Sweet and tasty, but not overly sweet. This one was my Nana's favorite! Fall! When a baker's fancies turn to pumpkin. Here we pay homage to those glorious orange beacons of the season with our Pumpkin Whoopie Pies. 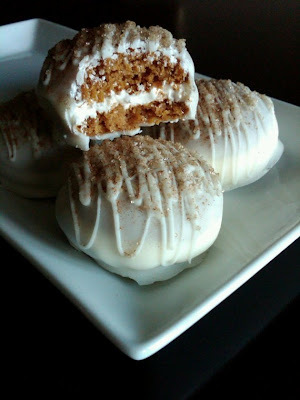 Two rounds of pumpkin spice cake with a cream cheese marshmallow buttercream filling, coated in a white candy coating and dusted with saigon cinnamon and turbinado sugar. Perfect for a cozy Fall afternoon with a mug of hot cider or to impress holiday party guests. Makes a unique alternative for Thanksgiving dessert or a great hostess gift. I had fun doing this feature because...hmmm.. I wonder why???? Oh yeah, I got to eat the BEST Whoopie Pies I have ever tasted!! Vanilla Raspberry, Elvis Fluffernutter and Chocolate Peanut Butter! FULL LIST OF FLAVORS ON Happy Endings BakeShop Facebook!! Excellent customer service, HIGH quality whoopies, super fast shipping, everything was so fresh and yummy! Happy Endings Bakeshop is a bake-to-order business with a menu of hand baked yummy treats designed to make you smile. Our signature goodies include Whoopie Pies in over 30 flavors, hand-dipped in special coatings, Stuffed Brownies with your favorite candy bar baked in the center, Brownie-stuffed Chocolate Chip Cookies, Brownie Bon Bons and Fudge-topped Brownies. We are based in the Detroit Metro Area and deliver locally. We also ship nationwide. Promoting world peace one dessert at a time. wow! what an awesome thing to be sent to be reviewed, hahaha :) the red velvet ones are sooo cute!